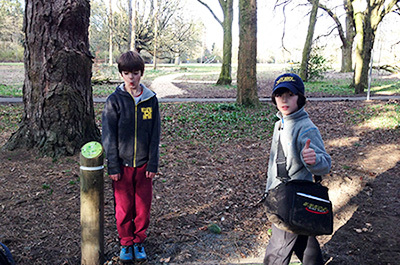 The O’Brien boys hit the road with a stop off at Rosshall Park, the new Disc Golf course that I had recently designed. 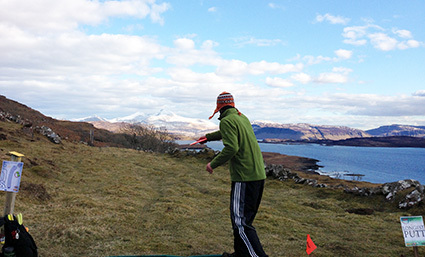 We painted the tee posts and played a couple of holes then we drove along Loch Lomand to the Crainlarich Hotel to rest up before an early start the next day. Oh what a beautiful morning! Blue skies and snow capped mountains! Suddenly a wide truck was coming rather fast in the opposite direction so I had to move over to the left to make room, then the passenger side front wheel went over a nasty big hard bump. 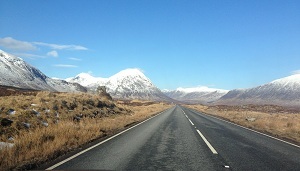 The car seemed ok, but by the time we got into the middle of Glen Coe the car was veering to the left… puncture! I pulled over and had to empty the boot and make a tyre change, but what an amazing place to break down! On we went, a short ferry then a longer ferry and we were there in no time. 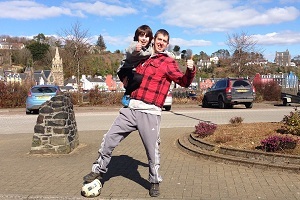 Straight to Tobermory to pick up provisions and call in at the garage. 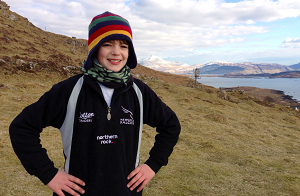 Ordered a new tyre for the following week and then we went to Dervaig to get settled into the village hall. We hit the course in the late afternoon, played a few holes and then it was an early night, ready for the 21st Scottish Open! 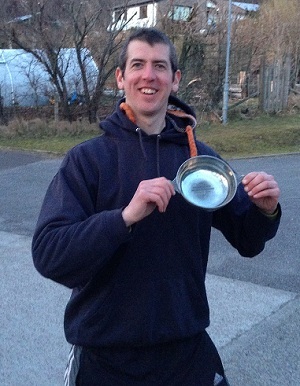 My first trip to Mull was with my good friend Vic in 2010, the year that Bruce (national director of the BDGA) won. I returned in 2012 and finished 3rd, with the mighty Neal Pickett being victorious with his Blowfly brilliance. So could it be 3rd time lucky? I could only dream. Early rise for a British Military Fitness style warm up, some putt and approach shots around the village hall and I was feeling ready. Got to tournament HQ, threw some short drives, did more putting, delay to the start, some more short drives, more putting, waiting… eventually players meeting and then we hit the course. I played with youngest son Joe and local player Alfie. The crack was good, the golf satisfactory and it sure was nice to play from the tee pads! The highlight was Joe smashing his beast in from 35m uphill on hole 12 for a birdie 2. And then he struck a birdie again on the down hill 16, this time a 12m putt with his Spider. A class act! Gremlin, the owner of the croft, provided us with some tasty pea and ham soup for lunch while we shared stories about the highs and lows of our morning rounds. Four open players at the 54/55 mark, including myself and Derek ‘the Wind’ Robins (a.k.a. Del) ahead on 51. For round 2 I played with eldest son Charlie and George Aslett. 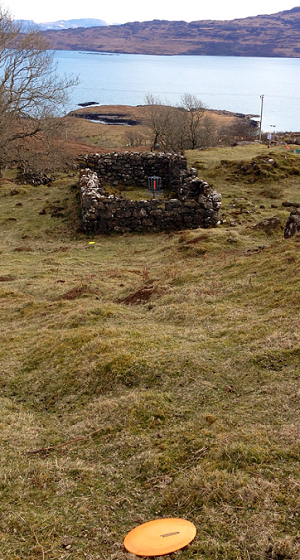 This time the white course which included some epic longer holes at the back of the course. Charlie played a very tidy round with 78, it was a 58 for me while Del posted a 56 and James Luton a splendid 53 (including an awesome ace on hole 1 followed by a streak of birdies) to keep him just 1 behind Del. On Sunday morning I had the pleasure of playing with Del, James and Charlie Mead. The wind was more Mullish and I remember getting off to a solid start and picked up some birdies and should have continued to but a short approach on 11 and loose approaches on 13 and 14 took me off the boil. In the end I carded a 60, Del a 61 and James slipped a few shots with a 64. Charlie M also took a 64 while Ivan shot a very nice 58 to get into the top card for the 4th round. Before leaving the course after round 3 I stayed back to work on the only part of the game that wasn’t tuned in.. the approach shots. On Mull it’s crucial to approach well and I knew I couldn’t afford to continue leaking shots in that department. The greens are small and with the wind and nasty drop offs there is very little room for error. I realised I wasn’t being specific about what I was aiming to do with the throws and I was playing with doubt in my mind. I didn’t fully trust my grenades on the course although I was hitting my marks pretty well in practice, so stuck with the backhand mostly. In this 10-15 minute little session I realised that the disc was going where I aimed, which was reassuring. When I aimed for a general landing area it went in the right direction, but when I really zoned in on specific vision and got a feel for it I threw with full commitment and it worked a treat. So round 4 began. The wind was still doing it’s thing but fortunately I didn’t need to do a lot of approaching during this round as several of the drives were parked and most of the others left me with a look at birdies – happy days! By now I knew that Del was ahead by a few, playing well and feeling in control. I knew I had to turn up the heat again. The 13th has an elevated green and the wind was strong from right to left. 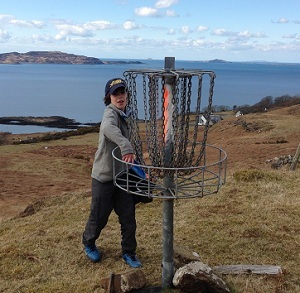 I ripped a beat-in Drone straight at it to leave a 4m putt, and ‘kerching’ – I picked up a stroke there. We both parked 14. On the blind 15th Ivan was spotting, I threw my Demon just how I wanted but I wasn’t sure why Ivan was watching it for so long.. had it rolled down the hillside? Hurray! It landed about 8m short and slowly rolled toward the basket and sat right underneath the cage, Ivan told me with a wry smile. Del took a 3 but it was the next hole that was perhaps the most pivotal. Hole 16 tees off from the highest point of the course down into a bumpy sloping green with a strong headwind to deal with. I punched a Drone to about 10m short of the basket. Del’s Drive was closer, with about 6m to go. I watched Ivan successfully go with an upside down approach from about 11m. But that bumpy green made me worry about roll-aways and so I raised my gaze to the chains… ah the sweet chains just hanging there with the blue sea in the background – surely the basket is a safer place than this bumpy hillside! And then I noticed that the wind was actually virtually non-existent as we were sheltered from it under the hillside of the 13th. So that was it, I had decided where the sacred Challenger had to go… I stepped up, went through the routine and sent it home. Del unfortunately missed, had a roll away and took a 4. The headwind presented quite a challenge throughout the day. 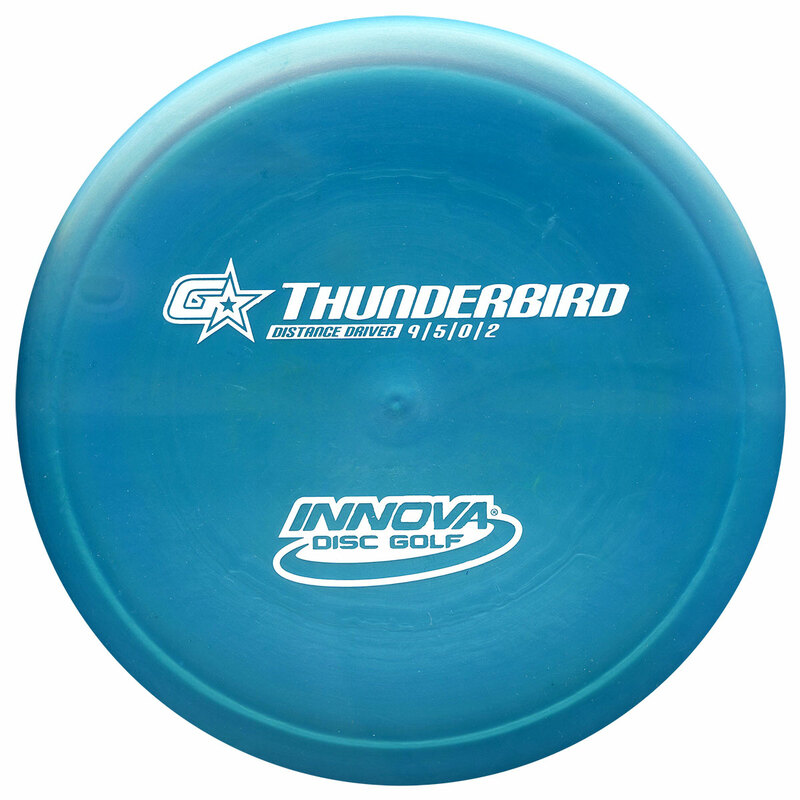 Disc selection was key. I ripped my Xcal down 17 to get a nice look at the basket. I gave the long downhill putt a good run, just missed by 18 inches to the left, perfect height. Safe 3. On 18 I ripped a Pred down to the green and took a 3 (total 48). Del’s Destroyer turned over and flew OB long. He recovered from a tricky spot, but carded a 5 (total 53). So after the 18 holes I was 1 up. The plan was to carry on into the finals straight away, so I stayed on the course. That didn’t actually happen, I don’t know why, but I was glad for the break. I laid on the grass and had a really relaxing and peaceful snooze. 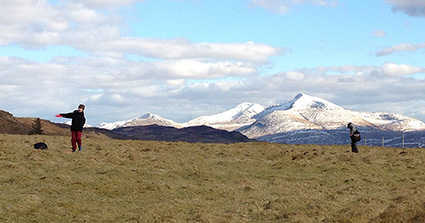 When I came round and opened my eyes it was heavenly – such an amazing view for miles and miles all around. I got up and had a gentle warm up, threw a few discs and was ready for the final 6 holes! So there we were on the 1st tee and in the lead by 1. The lead went back and forth a couple of times and then on the 17th tee I found myself 1 behind. The headwind was still blowing pretty strong. Del turned his Destroyer over way right to leave him needing 2 really good shots to get to the house. My Pred was short but on line, leaving me a blind shot down to the house. Del’s 2nd was very good, but his 3rd found a gap behind the house and rolled down quite a way. 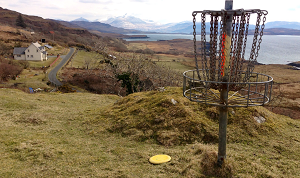 My second was close to the house, leaving me with a blind putt over the wall from 10 or so metres. Del’s approach didn’t make it into the house. My run for 3 was close but hit the rim. I took a 4, Del took a 6. I had driven well on 18 all weekend, always getting on or around the green. So although I felt the tension I was confident to make a good drive. I wanted to take the more stable Pred as I had seen so many drives turn and go way right. But the OB left was too risky so I went with the Z Pred and sure enough it turned quite a bit, but with good height it came back left a fair bit too. It was pin high but 35-40m away leaving a downhill, 2 o’clock headwind approach onto a down sloping green. Del’s was dicing with the OB but was safe. I knew an up and down would be job done. But it wasn’t easy. 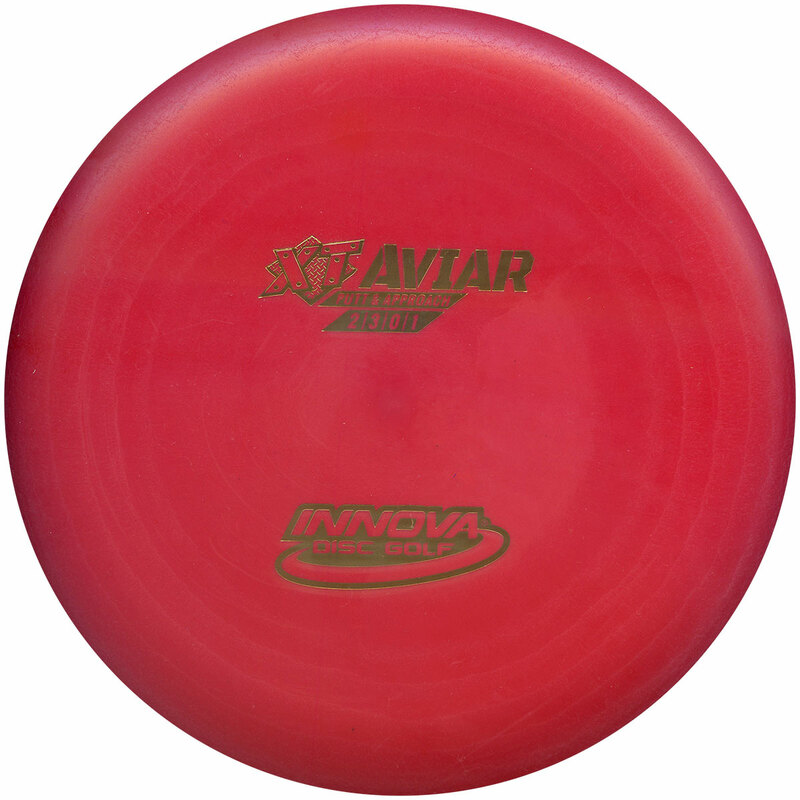 Do I hyzer the Soft Challenger? No, it might lift and go way left. OK, I’ll go for a flat throw, aim left and let the wind turn it right. That’s what I did, but it didn’t hit metal and flew past to leave me with a 10-11m downwind putt, slightly uphill. Del’s approach was good for a safe 3. So I had this for the win. I hit the line, but it missed, either high or low I can’t remember, low I think. So sudden death play-off here we come!! After watching a lot of golf play-offs at the Masters on TV I was pleased to be experiencing one in reality. Never mind the green jacket, this was for a giant jar of Gremlin’s awesome chutney! Eee by gum you could have cut the tension with a knife. Hole 1, Del drove first, a great shot with his Soft Magnet looked like it may be parked. My drive only just made the gap and came to rest on a large rock right on the edge of a steep drop off. On the putt I was aware of the gallery behind but focussed on the shot in hand. I took my stance right on the edge, all I could get was a narrow straddle, balancing on the balls of my feet, but as long as I could push through the legs I was happy. 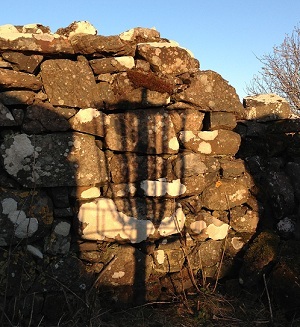 The basket was about 2m above and about 10m with a tail wind. I took a few strokes to get a feel for it and then hit it firm with the right shoulder. Bang – never a doubt. The gallery went wild! Next up was Del who wasn’t parked at all. He had a 5-6m tester into the stiff breeze. He didn’t even blink – just popped it straight in. A great reply. So off to Hole 2. Del’s drive was a bit left and short, mine pin high to the right. First up Del from 15m gave it a good run, safe 3. So again I had a putt for the win. This time about 9m. On this fast and breezy green I gave it a chance but hit the cage, and quite pleased to leave myself with a simple drop in. On to Hole 3. Del’s drive ended up below the basket with a 6-7m putt. My drive went onto the top level to the left, with a 10-11m real death putt. With respect to Del I knew I had to go for it. I did, but again hit low for a safe drop in. All I could then do was sit down and watch Del take the winning putt. But… to my disbelief it didn’t drop. Hole 4 Del’s drive was good, I crushed mine to leave a chance of a 2. It was an uphill 14m attempt which I didn’t convert and we both walked off with 3s. On Hole 5 the wind was too strong to go the hyzer route around the trees and over the OB so we both went the conservative route to leave 30m up shots. I gave mine a good run and for a second I thought I had it, but it wasn’t to be. I had to tidy up a 4m putt. Another pair of 3s. The 6th hole (this is where destiny eventually revealed itself!). Del’s drive was good, leaving an approach from 20m. In the previous rounds I had always tried to reach the basket as I had in practice, while airing on the right side. But it’s actually the left side that is easier to approach from, especially with the tail wind. So again I went for the basket, but I didn’t go for the definite turn over. The 150g Champion Teebird went straight and then stalled a little to the left, got caught in a bush and dropped under a huge rock. From o’top of this rock I played my approach, safely under the basket. My caddy, Joe then retrieved the Teebird which was awfully kind of him. Del’s approach was a little long, it was almost a gimme but it needed finishing off on that exposed rocky hill top. Del seamed to rush it a little and he missed to the right. So in a heartbeat it was all over. Del tossed my disc to me. I turned to the gallery who were at the bottom of the hill and threw the disc down and over their heads in celebration! It was great to get the win although I felt for Del as he must have been pretty annoyed about missing the short putt. I also had a sense of relief and weight off my shoulders about winning. By sitting down into a squat position (using the quads) it loads the whole body with energy and poise. From there raise the arm up to line up the exact point of release. For a short putt this will be on the pole. 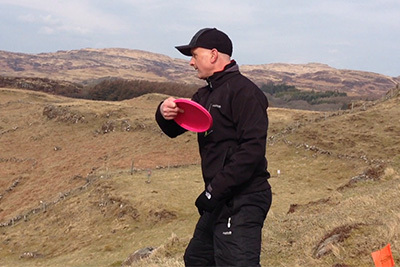 For a longer putt pitch the disc up on the exact required line (above and to the right of the target). With this, lift up the upper body slowly using the legs to get a feel of the amount of thrust required to make the putt count. Then draw the disc down on a perfectly straight line and load those quads up again by sitting back down into the squat position. This is all a slow and measured movement so far, combined with intense focus that transports the whole mind and body system into a lethal putting machine. 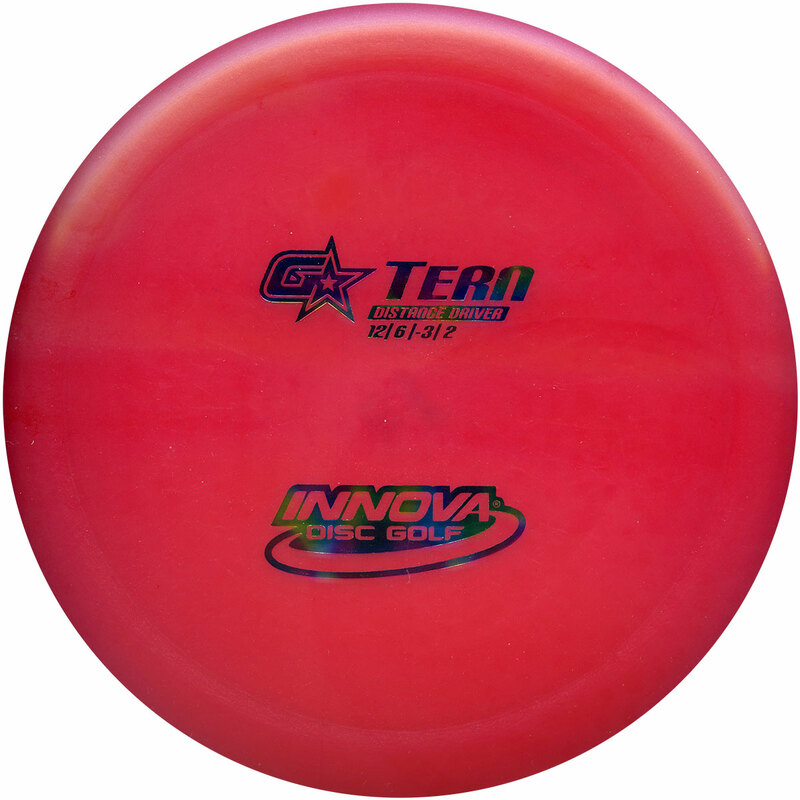 Accelerate up to eject the disc out of the hand in a springy, spiderman-style, pop. At the same moment the back leg kicks back and all the weight is on the ball of the front foot. KAPAOW! Focus on 4 basic things: Down, Up, Down, Up. I find that saying this in my head during the shot bypasses the conscious mind and enables the muscle memory to take over. This also helps to make every putt mean the same thing, whether it’s a birdie, par save or final putt of the round to take the win or make a new personal best (PB) score… down, up, down, up! It’s pretty simple, but very effective. This tip made an impact on other players results yesterday. 11 out of 14 players broke their PBs and I hit 9 birdies to shoot a 9 under par 48, just one throw above from my PB for this course. You can see a clip of my form in action very briefly on ‘Charlie O’Brien UK No.1 Junior Disc Golfer’ BBC Look North video from the gallery. Jump to 1 min 24 seconds to watch this down-up-down-up form. Here the initial ‘down, up’ appears to be combined, but since this was filmed I make an effort to execute this ‘down, up, down, up’ sequence with clear distinction at each stage. Dynamite. Chris O’Brien on tee 1 of the Winthrop Gold course in Rock Hill, South Carolina – home of the United States Disc Golf Championships. This video was filmed by Disc Golf Hall of Famer Derek Robins in October 2010.